PM Netanyahu, in interview on Fox News, says a nuclear Iran threatens not only Israel but to the U.S. and the entire world. 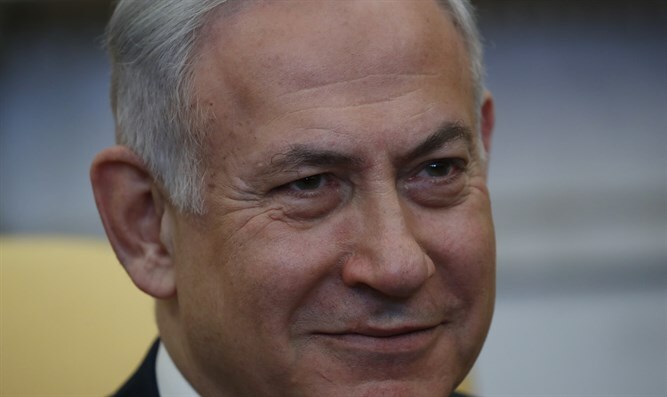 The three biggest threats facing Israel are “Iran, Iran, Iran”, Prime Minister Binyamin Netanyahu said in an interviewed which aired Sunday night on Fox News Channel’s “Life, Liberty & Levin”. “Ultimately they wanted to get a great state…but they also want to develop nuclear weapons. And I think that has to be stopped. And I see eye-to-eye with President Trump on that and I think he’s done a major change in American policy to stop Iran from getting nuclear weapons. Can you imagine a radical Islamic regime, with ICBMs, sponsoring terrorist groups and having atomic bombs?” added Netanyahu. Iran with nuclear weapons would be “a probable danger and not only to Israel, but to America, to the entire world. And by the way, you know who agrees with me on that? Just about everyone in the Middle East. Just about all the Arab governments. It’s a big change. So I think this is the number one challenge that we have,” he explained. “Everybody said after the nuclear deal that Iran, you know, coming out of the gate, would be a more moderate, more peaceful country. The exact opposite has happened. They use the relief of sanctions to get billions and billions of dollars, which they use to fund this aggressive empire; to fund terror worldwide. To fund aggression. And I think it’s important to prevent them from continuing these malevolent acts,” the prime minister said. “And above all, I think it’s critical for the security, not only of Israel, but of the world, to prevent this rogue Islamic terrorist-sponsoring regime from having nuclear weapons. You can see on the other side of the world what a rogue regime with nuclear weapons does. Well, multiply that 30 times and you’ll get the danger of Iran. Iran must be stopped,” he continued. “And secondly, you know, over time they've got to understand what Israel is about. It's technology, it's capacity to help them to live in the area. They're interested in that, too, much more than people think,” he continued. “Are there problems left? We have the Palestinian issue that we still haven't resolved, but in a way, we're out flanking them, for awhile, not formally. It will take some time. But I draw a lot of hope from the new relationships of Israel to the Arab states,” he said. Netanyahu also praised President Trump for recognizing Jerusalem as Israel’s capital and for moving the U.S. embassy to Jerusalem in time for Israel’s 70th Independence Day, saying that “all Israelis applauded” when Trump announced his recognition of Jerusalem. “There’s a sense of history here. I said this to the president when I spoke to him in the Oval Office the other day. I said, we have a long memory. We remember how 2500 years ago the Great Persian King Cyrus issued a proclamation that allowed the exiles, the Jewish exiles in Babylon to come back to Jerusalem and build our temple there,” he said. “We remember how 100 years ago the British Foreign Minister, Lord Balfour, issued the Balfour Declaration, that recognized the rights of the Jewish people in our ancestral homeland. We remember 70 years ago how President Harry S. Truman recognized -- I think he was the first leader to recognize the Jewish state. And we remember how President Donald J. Trump recognized Israel, or recognized Jerusalem as Israel’s capital and decided to move the American Embassy there. These are historic deeds. They will be remembered by our people that way for the ages,” Netanyahu continued.